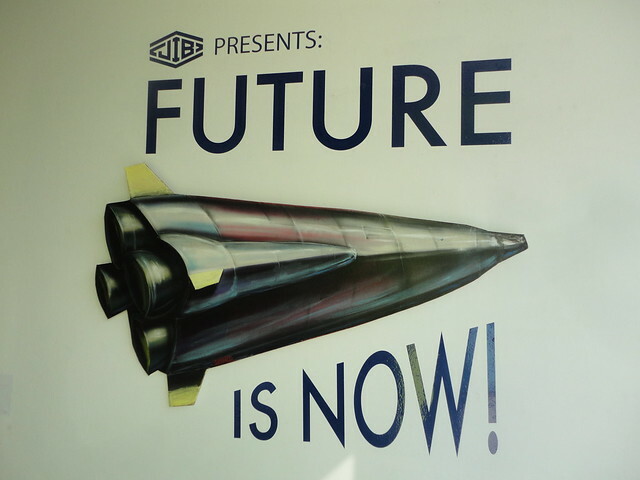 The Future is Now was yesterday. 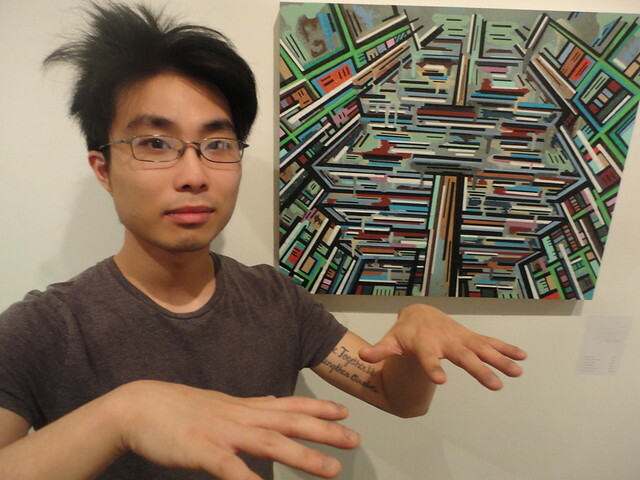 There were over fifty submissions, replies to our open call for a retro future theme art show that opened Thursday night, 3rd July 2014 at Hashtag Gallery at 801 Dundas St w in Toronto. 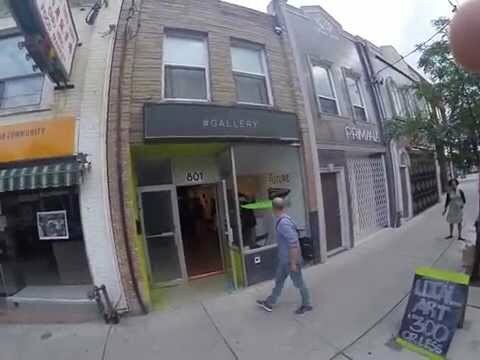 The trendy Trinity Bellwoods neighborhood has lots of cute little bars and cafes that came alive to feed and refresh people going to and coming from our little art show. The exhibition started at 7pm and the room was immediately filled with artists, musicians and intelligent people of all ages who were futurists for the evening. Here they paraded about pondering the pieces and having epiphanies. Sixty seven visitors came in the door over the course of the night to mingle and rotate about the room sipping grapefruit flavoured beer while contemplating fifty visions of a future that never was. The RetroFuture idea proved to be a fantastic concept for artists to explore, and the evening’s collection encompassed all facets of the theme including dystopian visions of technology and destructive forces, like a space octopus burning cities with its eyes (Mike Herman’s Time for a Vacation), but also shared positive glimpses of the future, like monkeys eating brain food (Mike Herman’s Better Living Through Chemistry) and strangely bio engineered crops and mechanical animals. There were both positive and negative visions of the future that never was, hung on the wall at Hashtag last night. 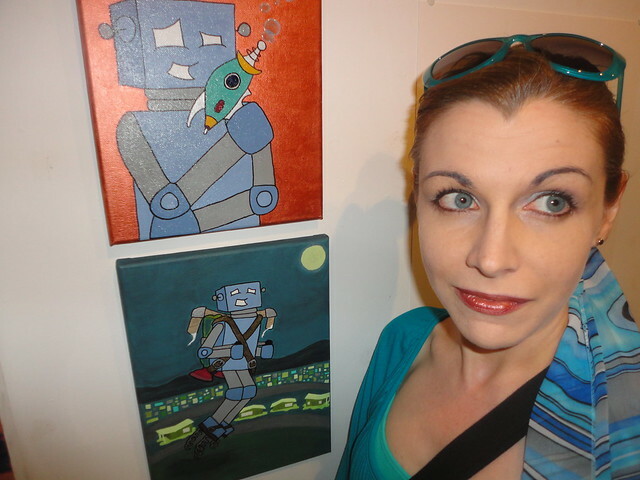 Here’s Katherin Miller beside Boris, a robot character she frequently paints and one who now has his own website which can be accessed at RobotofLeisure.com After drawing and painting Boris hundreds of times, Katherin Miller has imagined a complete life around this iconic creation. Its a fresh perspective on AI to imagine them just relaxing and enjoying themselves. Boris is original to be sure, and humans enjoy the irony that a robot such as Boris could lead a life of leisure, and that dichotomy is what drives interest in the series, and what has transformed Katherine into a ‘hero story’ painter. Katherin considers herself very fortunate indeed that she could put Boris up on the wall at this time, in this place, for these important people to see and for posterity here in this blog. Robbie Perchaluk has his own website, RobbiePerchaluk.com because he is a professional illustrator with twenty years experience in graphic design and publishing. Born and raised in Winnipeg, Robbie is now based in Toronto. 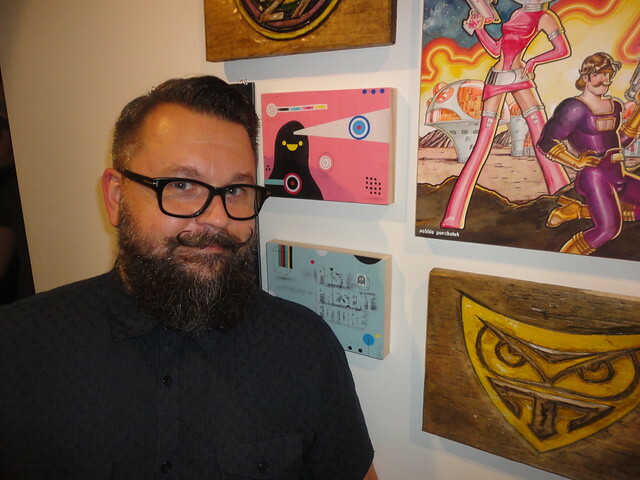 With several years experience in illustration and graphics design, Robbie has worked with a variety of clients including Walmart, DC, Marvel, Now and Dark Horse comics, The Sporting News, Disney and Mattel. 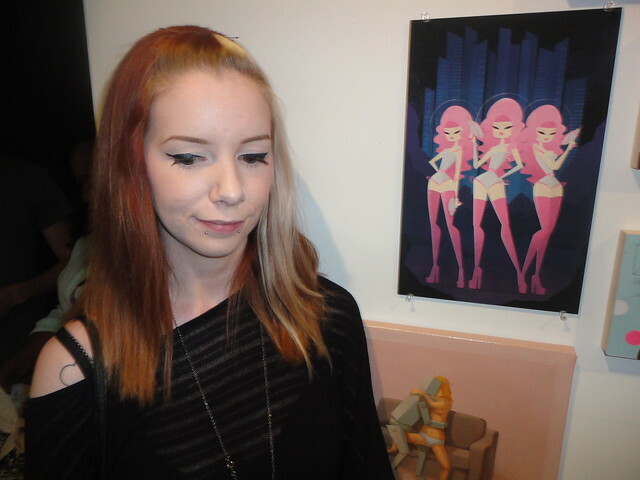 Nikkie Stinchcombe is pictured here beside her Retro Future Fembots! at the show. She’s a freelance illustrator based in Oakville, balancing a career in illustration while attending local craft shows and conventions to expand her online business Little Paper Forest . She attends these functions to show off her art and to further promote herself as an illustrator. NoCashOnPremises.com . He works here in Toronto as an illustrator, painter and character animator – Enziu has many years experience doing feature animation work. He also has a thing for details, and loves really well crafted music esp the percussion. 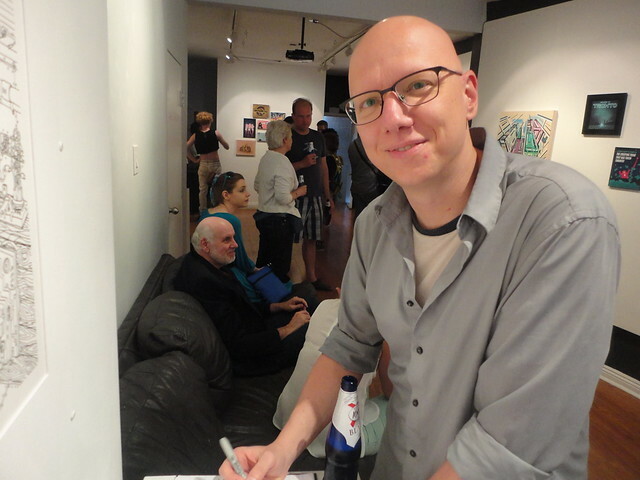 Michael came to us from Germany and loves collaborating with Canadians on anything that involves illustration/animation. 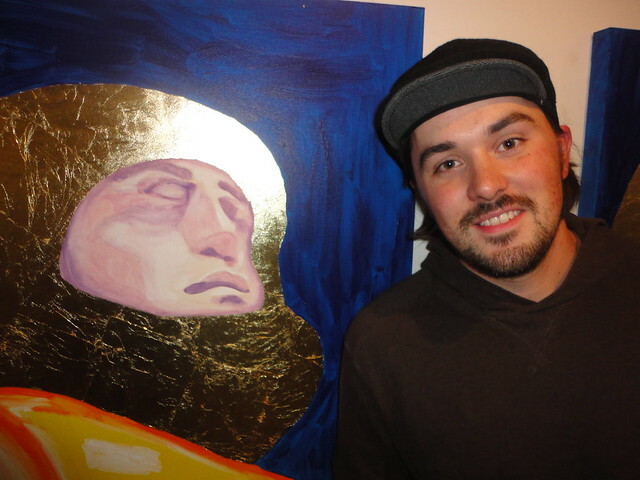 Morgan Skinner of MorganSkinnerArt.com is “an emerging artist whose work utilizes humor and play to create an iconographic program combining popular culture, religious, and art historical imagery to engage with contemporary social and political conflict and discourse”. That’s cut and pasted right from his website, which is slow to load but filled with beautiful work. And finally Mike Herman of ConcreteJello.com showcased the following painting called The Soft Seduction of Technology which is my favourite painting in the entire show because it shows how awkward it can be to kiss a robot on a couch… Wait a minute, is that Boris the Robot? leading his life of leisure?